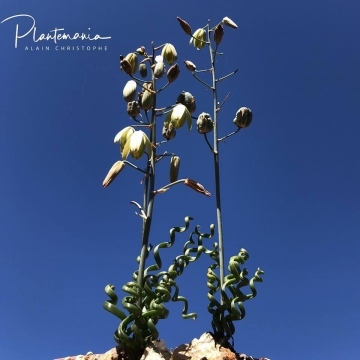 Origin and Habitat: Albuca bruce-bayeri is native only to the Little Karoo of the Western Cape. Description: Albuca bruce-bayeri is a beautiful small winter growing bulb. The leaves form an upwards spiral like a corkscrew, distinguishing it from some other spiral leaved Albucas (e.g. 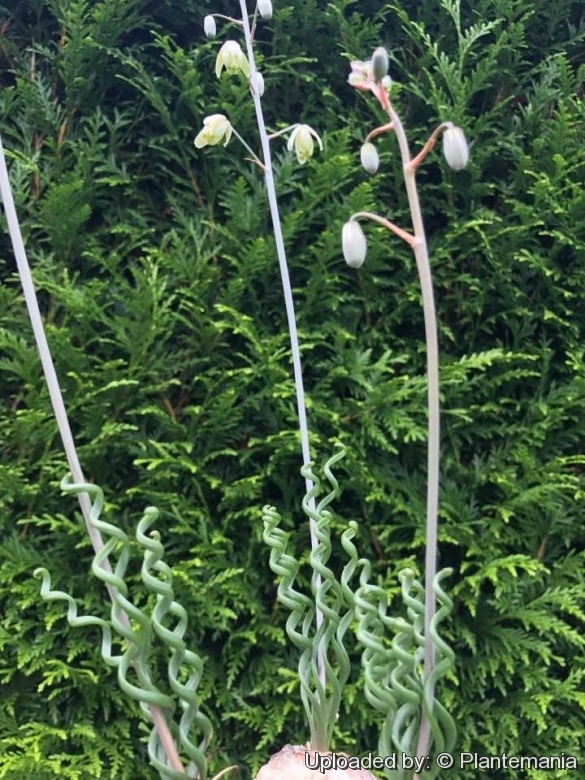 Albuca viscosa and Albuca namaquensis) that spiral sideways. The plants have nodding flowers similar to the latter two, but the flowers appear in autumn in the beginning of the growing phase unlike the other two that flower during spring. Taxonomy: Albuca bruce-bayeri is a local or morphological form of Albuca hallii, distinguished from the latter for the scape which is completely glabrous and tepals 13-17 mm long, greenish glaucous. Derivation of specific name: For M. Bruce Bayer (*1935), South African agricultural entomologist, succulent plant enthusiast and gardener, and former curator of the Karoo Garden at Worcester 1969-1987. Leaves: Sessile, green and strongly corkscrewed starting from the base of the leaves, with sticky sessile glands. In habitat often the leaves are clothed with sand grains sticking to the glands. Blooming season: Plants flower in the autumn along with the leaves. 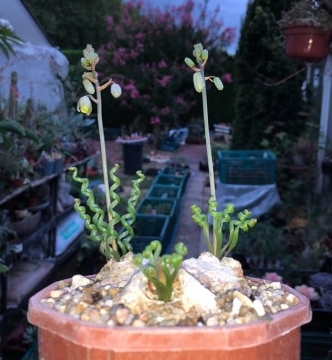 2) Pacific Bulb Society contributors "Albuca bruce-bayeri" Pacific Bulb Society Wiki <http://www.pacificbulbsociety.org> version August 16, 2015, at 07:21 AM Web. 8 September 2017. Cultivation and Propagation: Cultivation is not difficult as long as good drainage is maintained. Move it to the sun to maximize twisting.